The AUDIO BOOK Designed To Help Get Your Home SOLD Quickly! Dave Kohl has created more than 12,000 unique advertisements for properties which have sold around the country via various telephone hotlines, newspapers, magazines, web sites, TV, and radio stations. With more than 25 years of real estate and mortgage related advertising and marketing experience, Kohl has worked for real estate agents and offices, property owners and investors, and in media sales. He has hosted and presented seminars at a variety of realty associations and real estate broker organizations along with handling market research projects for business and property owners. In addition to broadcast reporting experience, Mr. Kohl also has seven semesters of college teaching experience. He was chosen as “Business Person of the Year” for 1990 by the Los Angeles Area Chamber of Commerce prior to joining First In Promotions as Marketing Director in 1992. Every year since 2005, Kohl has personally sold more than $1,000,000 worth of real estate and mortgage related advertising around the U.S., including online, newspaper, TV, and additional print publications. He also designed the “Real Estate Media Coach” to help realty agents with their marketing as well as public speaking presentations. Although he has never been a licensed real estate agent, his constant researching of property advertisements and working with hundreds of agents has shown him what is done right, as well as what goes wrong with the marketing of properties for sale. Over the past few years, Kohl couldn’t help but notice how short sales and foreclosures began to destroy the real estate market. “Distressed properties are sold to satisfy a loan obligation and not to determine market value”, he says. “Yet, too many appraisers and realty agents have gone along as if these determine market value”. The true inspiration for “8 Hours To Sell Your Home” came from personal experience, when Kohl’s own home was considered to have declined in value by 40% despite improvements having been made. A portion of the audio book is devoted to ways to fight low appraisals and win out over the distressed properties. 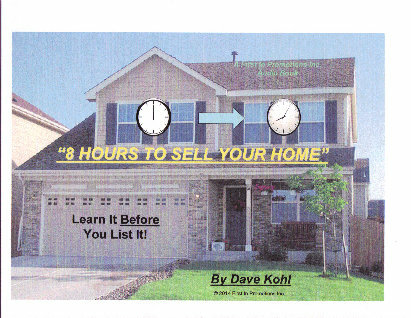 “8 Hours To Sell Your Home” was released during January 2014. 60 Chapters Filled With Strategies! "Book" Our Workshop For Your Group!